Our schedule was mostly back to normal this week, at least everything was in its correct time slot even if we had additional appointments. We tried to keep the week low stress and just go through our days accomplishing as much as possible without over extending Amber or me. Amber definitely has been in a rather difficult dysautonomia crash, but we're hoping to bring her up out of it soon. Physical therapy even took it easy on her because her heart rate was quite high Monday afternoon, and that was after ensuring her beta blocker was in full force during PT. The two therapists Amber sees are preparing a yoga program for Amber to use a home in the hopes it will help with core muscle strength and tone. Amber's ribs are subluxating anytime she tries to relax, so we need to help her with muscles that can hold them in place. Although we aren't really workbook style homeschoolers, we've been thankful for a few supplemental curriculum items this week that made it possible to accomplish lessons in less than ideal situations. The workbooks were much more portable than our normal curriculum, had shorter lessons which made it easier considering Amber's exhaustion and brain fog, and are mostly of the summary / overview type that we used to introduce topics for more detailed lessons later. We aren't switching to workbooks, but they can be useful at times. Despite the busy week and sickly week, Amber completed quite a bit of math, history, literature, writing, and music appreciation. She wasn't all that thrilled to work on science because there are several experiments waiting with each lesson. As much as I would like her to use all these experiments, they are holding her back in the lessons. We've got to solve this dilemma, quickly. Since the weather here has been unseasonably warm and dry, we took the time between doctors on Monday to stroll around a park I visited often as a child. It's not terribly close to where we live now, but is only a couple of exits away from the Children's Hospital specialty center. 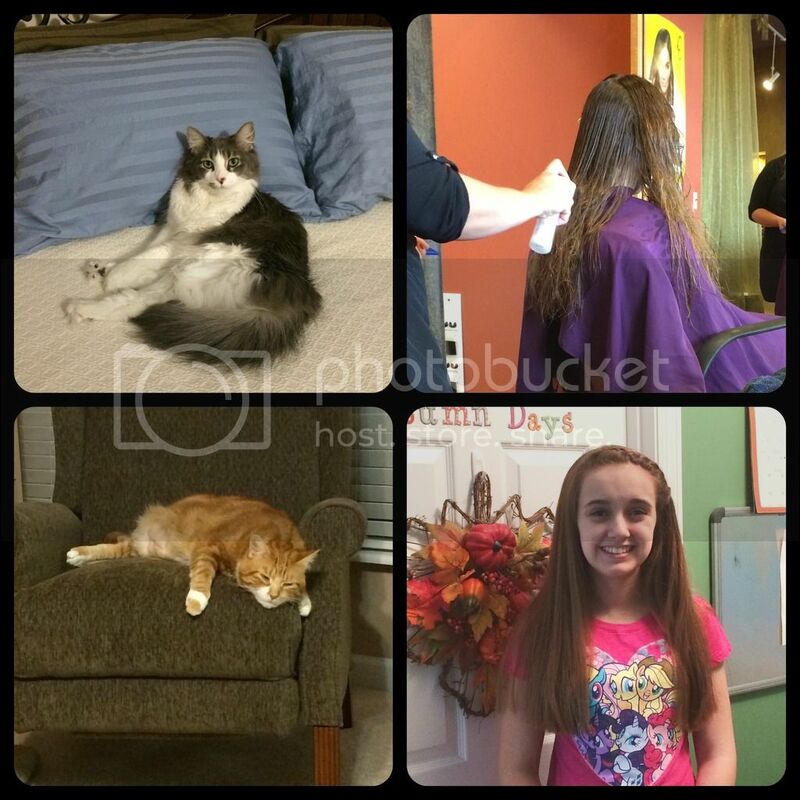 Amber's appointments were about 2.5 hours apart, but we live 30 minutes away. 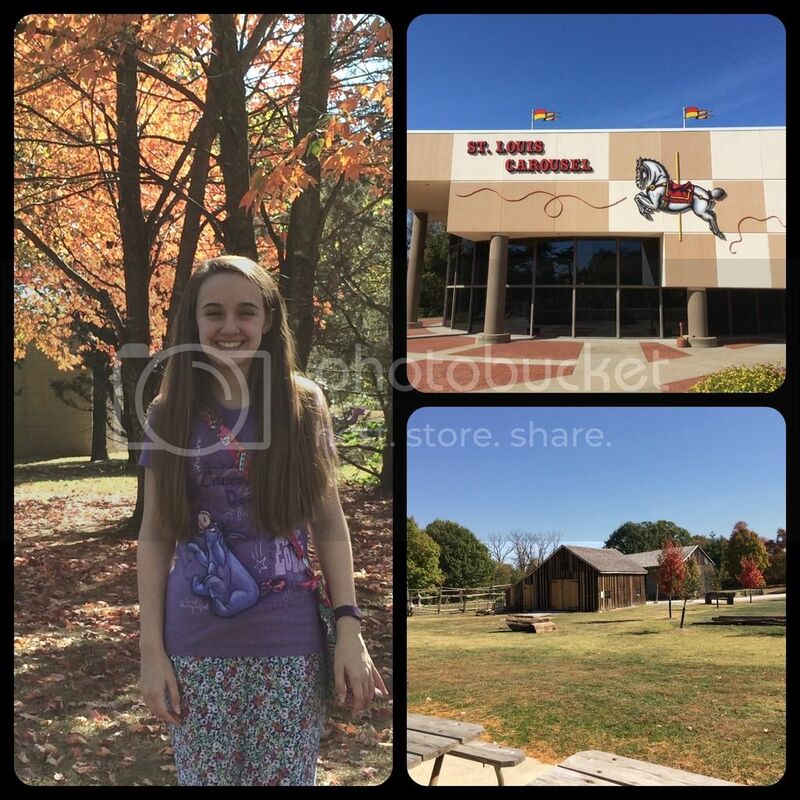 We decided to have lunch out in the area of the specialty center, then went to Faust Park. Housed in the park is the restored old carousel that my parents took Amber to ride once many years ago, however we belatedly discovered the carousel is closed on Mondays. We're going back again another day to ride. This Monday, we instead sedately walked through the trees, looked at the historic village they are creating with old buildings from the area, and just sat in the sun for a little bit before returning to the doctor. It turns out we can schedule a tour to see the interior of the buildings too, so perhaps that needs to be on our next visit as well. Hair cut day (before and after). (Top) Milori sleeping on the bed like he is a person. (Bottom) Biscotti ... still sickly. Today Amber had her first salon hair cut in years. She had approximately 5 inches cut from her hair along with some layering at the ends and for good measure we had it thinned all over. She has almost unmanageably thick hair and it was simply too long to care for anymore. It really doesn't look that different, and is still a good 6 inches, at least, past her shoulders. Still, she feels a difference and I'm sure it will be significantly easier to style. We waited all afternoon today on a call to pick up Biscotti. Despite another round of antibiotics, which still aren't complete, he began throwing up again overnight last night. I've never left my Biscotti anywhere without me before, but the vet wanted to observe him, then sedate him to check his urine and blood. I didn't sleep much at all last night since I was sitting up with my sick kitty. I hope tonight goes better. Turns out his UTI is back as bad as ever, even while on the antibiotic. He's been given an anti-nausea medicine, plus his urine was sent off for culture to determine which bacteria we need to target. We won't know more until next week when the culture is back, so for now he is on the same antibiotic to try and hold the UTI at bay. Hanging out in the park between doctors. Amber has a pretty busy social calendar for the next couple of weeks, along with her regular complement of activities and classes. Thankfully, she has been great at working through her assignments as listed in Homeschool Tracker, even when I'm not home. It really feels like we aren't moving forward in school much, but according to our logs she is 27% finished with her required core hours and total hours too. She was significantly farther along last year at this time, but I was more liberal in my tracking last year too. Perhaps I should reconsider what I track as school hours. We are not workbook people either, but find them useful at times. I am so sorry about your cat. I hope your doctor finds the right antibiotic. It sound like a all around hard week, but still filled with blessings. I so hope the yoga works at building some core muscle for her!! What a gorgeous art project! Did she make that at home? If so, do you have directions you can share? My daughter would love to do something like that. And I hope that Amber continues to feel better and get through her school work and activities. And I sure hope Biscotti feels better and that everything goes well with him! She made the art project in her art class at a local arts place. Instead of pottery on the wheel last week, they did it this way. Then it was being fired over the week to be painted at her next class. I'm so sorry your lil' kittikat isn't feeling so good. I do hope he feels better soon. 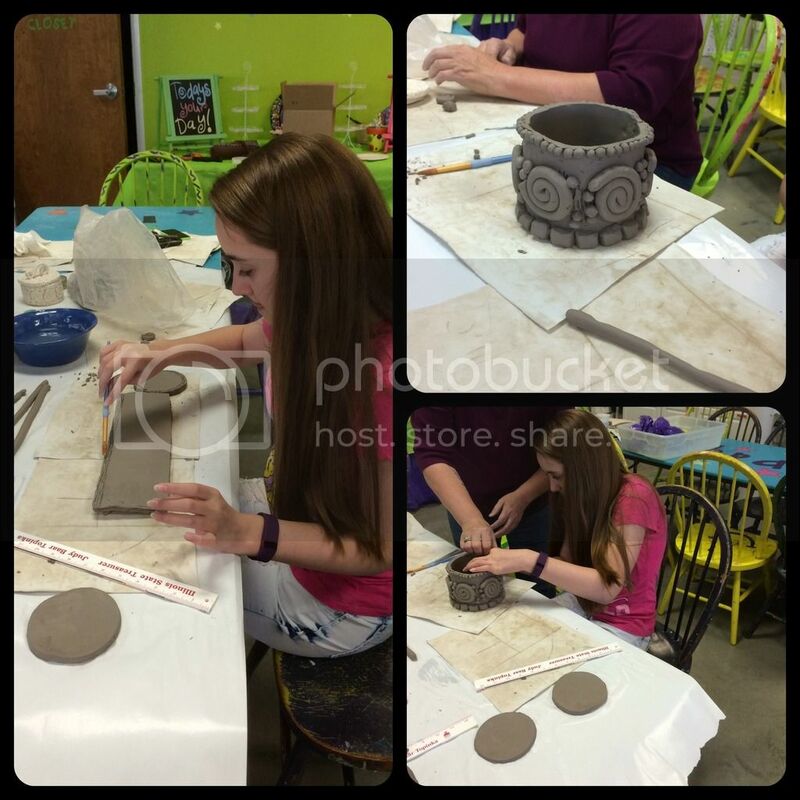 I love the pottery that Amber was making - it is stunning! WOW That art project is awesome. My girls would love something like that...love her hair cut! Oh man, praying for your cat and your heart. My cat had UTI's all the time...turns out for him, he was allergic to cat nip...we put him on special food, antibiotics for a while and kept him away from the nip,, he was fine for years...sadly he passed two years ago this thanksgiving 8( he was 16 yrs old...I pray yours gets better real fast! I love Amber's clay creation! She's really quite the artist! I think Yoga will really help Amber. Bethany loves it! I'm so sorry about Biscotti. I hope he gets better this time! The park you visited definitely sounds like one that you'll enjoy visiting again and again. I hope you all are having a great week!